There is some variation visible in the texture and colour of the wood used to make the upper and lower sections of the blade for spade 287.1967. The infra-red image highlights the variation in colour and grain direction between the upper and lower blade components. The UV image indicates the presence of a fluorescent adhesive at the junction of the upper and lower wood components of the blade. This suggests that the spade has been repaired in the past. Multi spectral imaging revealed the presence of what is likely a post collection repair on spade 287.1967. The darker coloured wood used in the lower section of the blade in the images above has a somewhat different texture and grain direction to the rest of the blade. 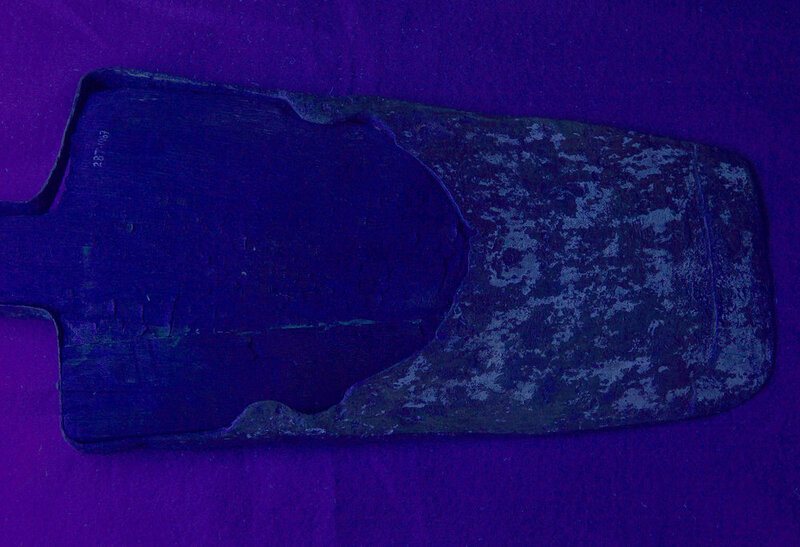 The UV image above highlights a band of fluorescent adhesive along the join between the two different wood sections which suggests that the spade was repaired or restored some time after it was collected. The wood sample collected from spade 287.1967 deliberately avoided the lower section of the images above, as this was considered to be a more recent addition. The image above is somewhat indistinct but appears to show inter-vessel pitting. This indicates that the spade is made from hardwood. A small sample of wood was collected from spade 287.1967 as shown in the 3-D model above. A sub-sample was cut into thin slices known as 'sections', and these were mounted for examination using a scanning electron microscope (SEM). The scanning electron microscope can resolve microscopic features in the wood that help identify the particular species of tree that the spade was made from. Unfortunately the wood collected from this spade was in poor condition, and wood species identification is as yet inconclusive. The image above, showing what appears to be inter-vessel pitting, indicates that the spade is made from hardwood. The indistinct nature of the wood microstructure in this sample precludes more detailed species identification for this object. 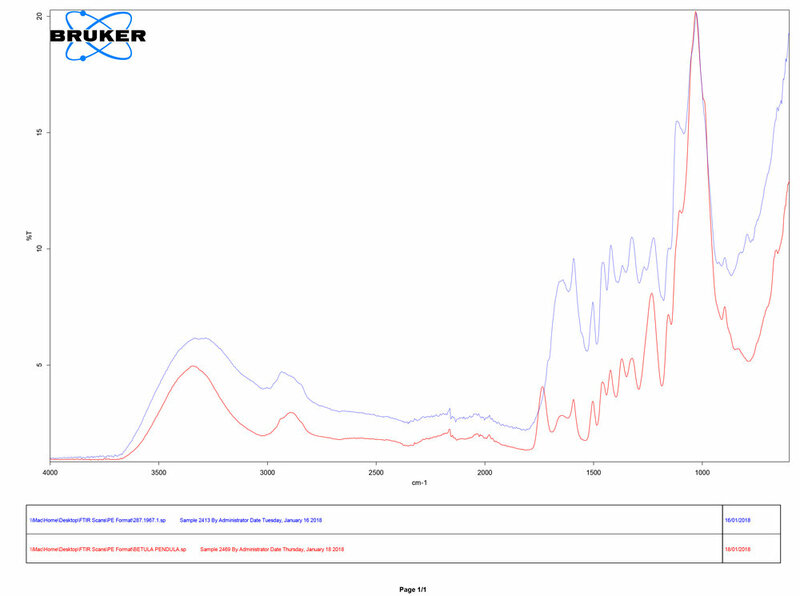 The sample of wood collected from spade 287.1967 was analysed using Fourier Transform Infrared Spectroscopy (FTIR). The spectral analysis above compares the sample from spade 287.1967 with a reference sample for European Birch wood (Betula pendula). As the predominant component of plant fibres is cellulose, and other major constituents (hemicelluloses and pectins) are also polysaccharides, the FTIR spectra of different cellulosic plant materials are superficially similar and cannot be readily distinguished by eye. In addition, degradation of one or more components of the plant material e.g. through oxidation of the cellulose molecule, will influence the position and intensity of spectral peaks relative to non-deteriorated reference spectra. While there are some minor variations between the spectra, the spectrum for 287.1967 corresponds with that of woody cellulosic material. There is no indication that the wood contains post-collection contaminants.